FREEDOM – are you truly free? If everybody likes you then I would say NO…..
Find out how your desire to be LIKED, might be keeping you from experiencing TRUE freedom. Have you ever decided NOT to say something, or changed your behaviour because you were worried about what others might think? 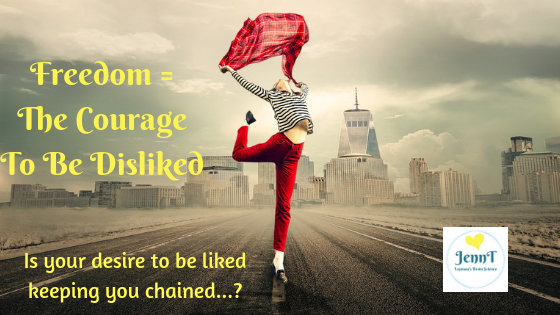 Were you scared that they might NOT like you….? Some examples of how this might manifest in your life: Have you ever said YES, when you really felt like saying no? Have you ever said your meal was lovely in a restaurant, because everyone else at the table was raving about how good theirs was? Have you ever NOT spoken your mind, not stuck up for someone, or not called someone out on their racist, sexist or some other offensive comments or behaviour, because you were scared that person might not like you anymore? I want to firstly clarify that this is different to the concept of changing your behaviour or staying silent, because you are ‘choosing your battles’. This is a whole other topic. What I mean is are you censoring yourself for the sole reason that you want to be LIKED and the idea of being disliked SCARES you? What is driving your actions? Power lies in being disliked!